Seemingly confirming the incriminating remarks from former Obama Deputy Assistant Secretary of Defense, Evelyn Farkas, on the mad scramble by the Obama administration to collect and preserve intelligence on alleged Russian election hacking before Obama left office, NBC News reports that a former Obama official admits they made a list of Russia probe documents to keep them safe. Obama administration officials were so concerned about what would happen to key classified documents related to the Russia probe once President Trump took office that they created a list of document serial numbers to give to senior members of the Senate Intelligence Committee, a former Obama official told NBC News. 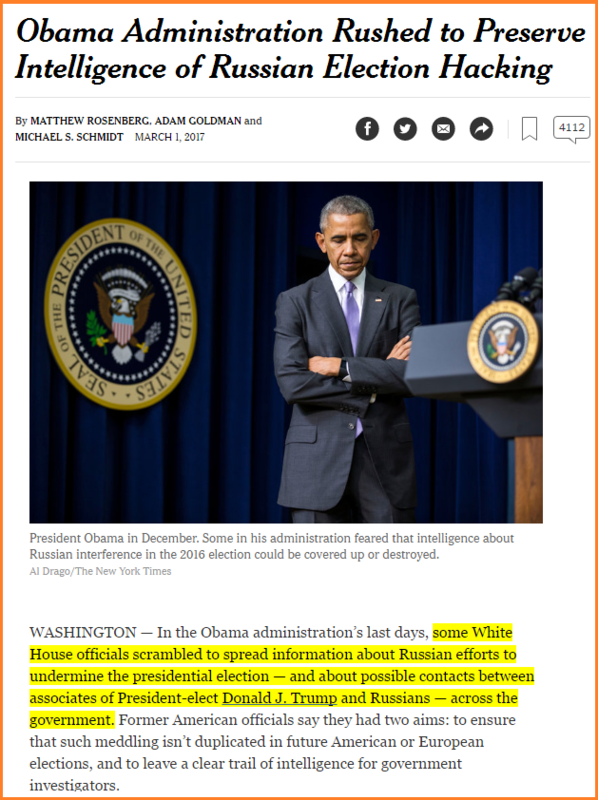 Furthermore, as we previously noted, Farkas effectively corroborated a New York Times article from early March which cited "Former American officials" as their anonymous source regarding efforts to leak this surveillance on the Trump team to Democrats across Washington DC.